Crowan coffee pot - 6" (152 mm) high. Harry Davis, born 1910, studied at Bournemouth Art School as a painter. He wanted to enrol for the pottery course but it was full. He spent his free time potting and impressed the head of the ceramics department sufficiently for him to find Harry a job as a thrower with Carter Stabler & Adams at the end of his course. In 1933 he answered an advertisement that had been placed by Bernard Leach for a thrower at the pottery he was setting up at Dartington. Harry got the job, but the project fell through so he went to work with Bernard and David Leach at St Ives. May Scott was a paying student at the Leach Pottery. Harry was running the pottery when Bernard and David were away; he taught May to throw in 1936 and they married the following year. They started their own pottery in South Kensington, London. Shortly before the second world war Harry was made Head of the Art School at Achimota College, Gold Coast (now Ghana). He stayed until 1942 successfully finding local materials for clay and glazes. May, in the meantime, had been helping Michael Cardew at Wenford Bridge, and it was at Harry's suggestion that Cardew was appointed to succeed him when he left. After the war Harry and May set up Crowan Pottery in Cornwall and ran it until 1962 when they moved to New Zealand. They ran the Crewenna Pottery there for ten years and then spent seven years in the Peruvian Andes working on an aid project. They returned to New Zealand where they stayed for the rest of their lives. Harry died in 1986 and May in 1995. The Davis's approach to pottery was not in the strict Leach tradition. While they disliked many of the aspects of mass production and the techniques used in large-scale manufacture, they were aware that technology had its place in the small workshop and were quite happy to use machinery when it could perform a task more efficiently, quicker or better than doing it by hand. 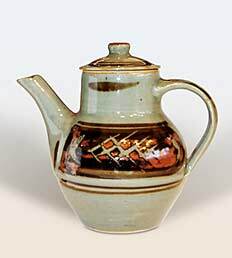 They made stoneware of very high quality and were proud that they produced stoneware that was extremely durable - a very desirable quality for household goods. Their studio pieces were usually brush or wax resist decorated and sometimes incised. Crowan Pottery was established in Crowan, Cornwall by Harry and May Davis. See their entry for details. Please support our sponsors and help offset the cost of maintaining this site by clicking on the banner links. The Pottery Studio is a knowledge base for lovers of studio pottery, art pottery, craft pottery, and just about any other kind of pottery. Help keep the site alive and growing by telling others about us and supporting our sponsors. © Copyright 2000-2019 The Pottery Studio. All rights reserved.